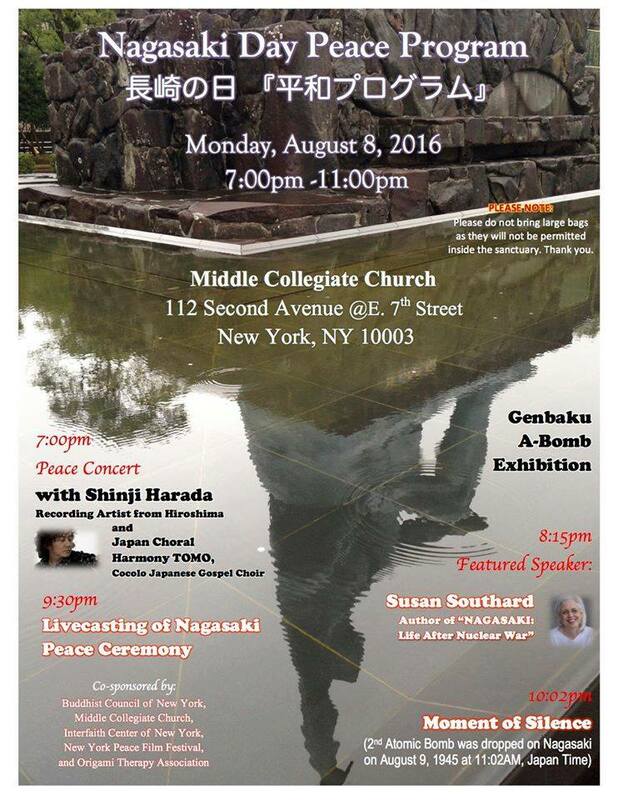 Monday, August 8 from 7:00 p.m. until 11:00 p.m.
Buddhist Council of New York, Middle Collegiate Church, Interfaith Center of New York, New York Peace Film Festival, and Origami Therapy Association are co-sponsoring the Nagasaki Day Peace Program, in observance of the 71st anniversary of the dropping of the atomic bomb on the city of Nagasaki during World War II. “The Other Side of the Story: The Aftermath of Nuclear War” by Susan Southard, author of NAGASAKI: Life After Nuclear War. 10:02 p.m. – Moment of Silence marking the time when the second atomic bomb was dropped on Nagasaki on August 9, 1945 at 11:02 a.m., Japan time.